August 09, 2008 by Alphageek in "alphageek bourbon whisky george dickel virginia abc"
Mrs. Alphageek and I stopped by the ABC store the other day. In the fine Commonwealth of Virginia, liquor is sold by the commonwealth in commonwealth stores. I guess it saves time to have the sales where everyone works for the commonwealth. That way, if someone underage attempts to purchase something, the offender can be hauled away very quickly. You might hear about someone who sells beer to minors, and gets a fine, but I have never heard of the ABC store selling to anyone underage. 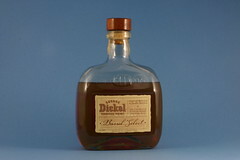 Back to George Dickel Barrel Select. I purchased this thinking I would take a picture before I enjoyed the fine drink. The bottle you see here did not quite make its picture appearance full. I sampled some when we got home. This is an exceptionally smooth and mellow whisky to enjoy. I found it was exceptionally good with a couple of ice cubes in the glass with a couple of fingers worth. Speaking of pictures, this picture is more aggressively color corrected than the last ones. That is the great thing about digital pictures, they can be color corrected easily. If I had taken this picture with film, it would have been difficult to fix the colors. Digital photography is really cool and geeky in areas like that. "alphageek bourbon whisky george dickel virginia abc"